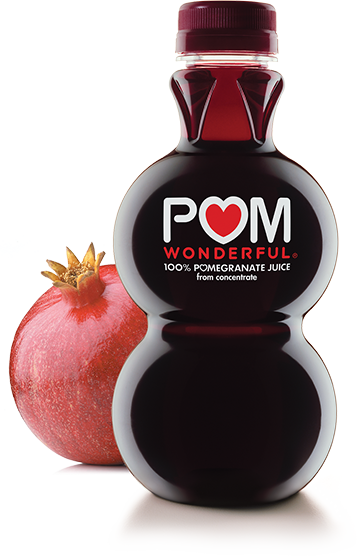 POM Wonderful offers a wide range of pomegranate products, all of which come from only one source: 100% California-grown POM Wonderful® pomegranates. With the health of you and your family in mind, we manage the entire production process﻿—﻿from tree to table—﻿to guarantee both freshness and flavor. Our signature product is our premium 100% Pomegranate Juice from concentrate. Each 473mL bottle contains the juice from four delicious pomegranates that were picked carefully by hand in California’s Central Valley. And POM Wonderful is a great source of potassium* and contains absolutely no preservatives, fillers, or added sugar. To leave us your feedback, please click here. Or you can call our customer care team at 877‑450‑9493. We look forward to hearing from you. ©2016 POM Wonderful LLC. All Rights Reserved. POM, POM WONDERFUL and the accompanying logos are registers trademarks of Canada Bread Company, Limited, and used by POM Wonderful LLC under license. The Double Bubble Bottle Design is a registered trademark of POM Wonderful LLC or its affiliates.